This Monday, the Minnesota Public Utilities Commission (PUC) took its final vote approving Enbridge Line 3 crude oil pipeline, the end of a long and painful years’ long process where many people who participated felt they played by the rules and got totally screwed, their voices ignored. 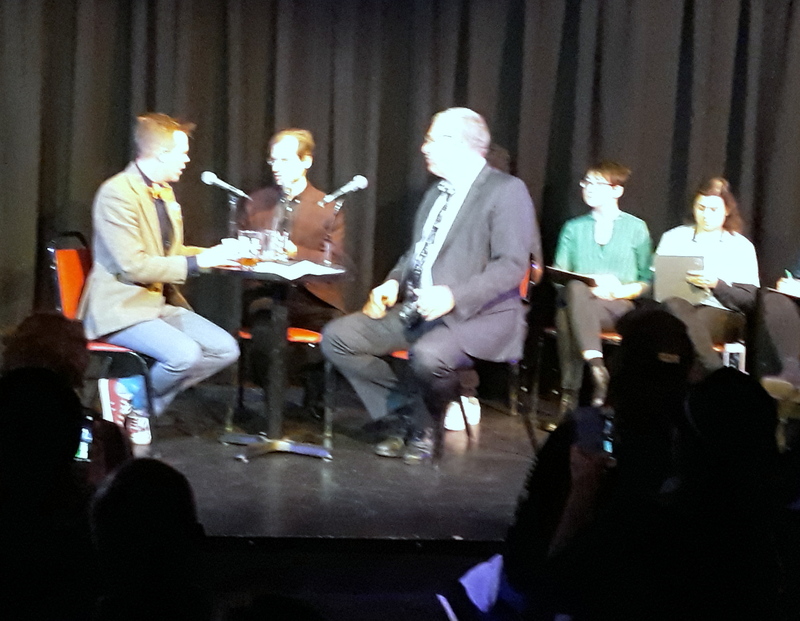 That same evening, PUC Commissioners John Tuma and Dan Lipschultz participated in Bryant Lake Bowl’s “Theater of Public Policy,” which mixes policy wonks with improv comedy. This is how it was supposed to run: Tuma and Lipschultz were there to be interviewed about how the PUC works, then improv actors were supposed to riff a few sketches based on their stories, followed by audience questions. The booing started before the show opened. The curtain dropped before the improv started. Heated interruptions and pointed questions from the audience shut it down. At the table: Emcee Tane Danger and PUC Commissioners Dan Lipschultz and John Tuma. The comedy melt down was the confluence of two big problems, one was bad timing. The show got scheduled before the PUC set the date for the Line 3 vote. More importantly, the producers should have known that people had bitterly contested the Line 3 decision and that a flood of emotion, hurt, and anger could be heading their way. Bryn Shank of St. Paul said he had “sort of” followed the Line 3 debate, and had come that evening to learn more. He wasn’t surprised about the mixed audience reaction to the show’s early curtain. “It’s mostly a theater for affluent white people who don’t have to deal with the consequences of Line 3,” he said. Emcee Tane Danger tried multiple times to quiet the front-row crowd, earnestly explaining to people that if they quit interrupting they would have opportunities to ask questions later. Here’s what Danger didn’t appreciate: Many of these people had been following the rules to stop Line 3 for years. They had sat through many PUC hearings and public forums, speaking from the heart when given the opportunity, filling out forms when forms were offered. It didn’t pay off. Repeatedly, the PUC seemed to cherry pick facts to suit its own purposes, ignoring key facts in the environmental impact statement, ignoring key recommendations in the administrative law judge’s report, ignoring the Minnesota Department of Commerce’s analysis. These audience members were in no mood to show deference to PUC commissioners and keep following the rules. Listening to Lipschultz and Tuma speak in generalities about the PUC — for the sake of comedy skits — was just too much. Lipschultz in particular looked miserable on stage, like a man at the All Night Dentist. In response to Danger’s questions, Lischultz gave the Civics 101 version of the PUC. There was no avoiding provocation. Even saying something as simple as “the PUC follows state laws” was sure to draw a loud response. Line 3 resisters don’t believe the PUC followed the law in approving the pipeline. Lipschultz talked about the PUC’s concerns about reducing carbon emissions. That was another trigger for audience members who heard that comment as shear hypocrisy. The PUC had ignored Line 3’s predicted climate damage of $287 billion over 30 years, or the research that said building Line 3 would have the same climate impact as building 50 new coal plants. The PUC sided with a foreign pipeline company, approving a project that threatened climate, water, and treaty rights. For Native peoples in particular, it was replaying old trauma of being completely ignored and abused. There was nothing funny here. Comment: The Theater has a fine goal, using comedy to make basic civics lessons accessible to the public. In this case, however, the Theater hadn’t done its homework to understand how this issue would play out. That said, I could argue that this particular performance could have been the Theater’s most instructive ever. Protest is an important part of the public policy process, and a very American thing. Audience members got it up close and personal. Thanks for coming and writing about it, though. I hope we’ll see you again.